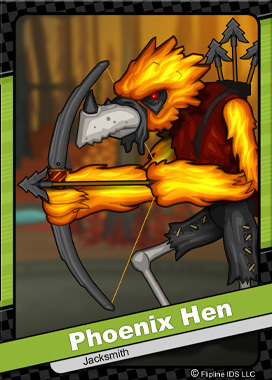 Phoenix Hens are hot-headed archers that can be found hiding among the charred trees of Cinder Springs. Phoenix Hens are a type of Henshot that has been enchanted with the element of Fire. There are seven other elemental forms of Henshots that are all under the control of the great wizard, Dudley. Other variants include Gillbeak, Frostfeather, Roosterite, Plucksquall, Thundercluck, Grass Gizzard, and Henwraith.